This week, we dig into two good-but-not-great defensive performances by the IU defense. Along the defensive line, Gavin Everett returned after missing the Ball State game due to injury, but IU never quite made it to full strength up front because Jacob Robinson suffered an injury during practice the week of the Michigan State game. In Robinson’s absence, Jerome Johnson’s playing time has ticked up, and the big redshirt sophomore has held up quite well. After Johnson, Brandon Wilson has been the next man up, and against Rutgers, usual NT reserve Kayton Samuels slid over to DT. At linebacker, there are two distinctive lines: the first line of Dameon Willis and Raekwon Jones, and the second line of Thomas Allen and T.D. Roof. Unlike what we’ve seen in previous years, these tandems have rarely been mixed and matched through five games. The exception: in passing situations, Micah McFadden occasionally comes in for Thomas Allen. Things got interesting at the Husky position after Marcelino Ball was ejected for targeting in the 2nd half against Sparty. The usual 2nd teamer, true freshman Cam Jones, came right in and appeared to hurt his arm making one of the better plays I’ve seen by an IU defender in coverage. He didn’t return against Michigan State and did not play against Rutgers. With the two-deep essentially wiped out heading into the 1st half against Rutgers, IU went with usual safety reserve redshirt freshman Bryant Fitzgerald as the starter and spelled him for a handful of plays with true freshman Jamar Johnson. Then Marcelino Ball returned for the 2nd half and order was restored. A’Shon Riggins missed the Rutgers game with an undisclosed injury. Raheem Layne started in his place and even before Riggins’ injury, Layne had already carved out a fairly even split with Riggins. On the bright side, defensive ends Allen Stallings and Nile Sykes have begun to assert themselves. After combining for just 1 pressure in IU’s first 3 games, the duo has racked up 8 combined pressures in the last two games. D-line coach Mark Hagen has said that IU’s best pass rush personnel is when both Stallings and Sykes are on the field, and we’ve seen more of that in passing situations the past few weeks. The Andre Brown Perfect Season was bound to end sometime. Sure enough, MSU’s Felton Davis rung Mr. Brown up for a pair of completions. Brown wasn’t Brian Lewerke’s only victim, as fellow corners Raheem Layne and A’Shon Riggins also gave up relatively big plays. The secondary’s performance against Rutgers was somewhat better, although probably not as dominant as one would hope against an offense that has struggled as much as Rutgers has. IU’s freshmen – both the true and redshirt varieties – were targets here, as Jaylin Williams, Juwan Burgess, Bryant Fitzgerald and Devon Matthews all allowed more than 10 yards per target. That said, IU’s six passes defended, including one interception, is a season-high. That interception came from another true frosh, Jamar Johnson. All Jamar has done in extremely limited duty is record a PBU and an INT on the only two passes to come his way. Looking ahead, this young secondary needs to grow up in a hurry. In the next three weeks, they will face: (1) one of the best pure passers in college football, Ohio State’s Dwayne Haskins, (2) a likely early round NFL draft pick in Iowa’s Nate Stanley, and (3) dual-threat stud Trace McSorley, who has cut IU up the past two seasons. The MSU and Rutgers games suggest that all three QBs will complete some passes, but the hope is this secondary can (1) limit truly big gains, which I would define as more than 30 yards, and (2) make a few plays of their own. 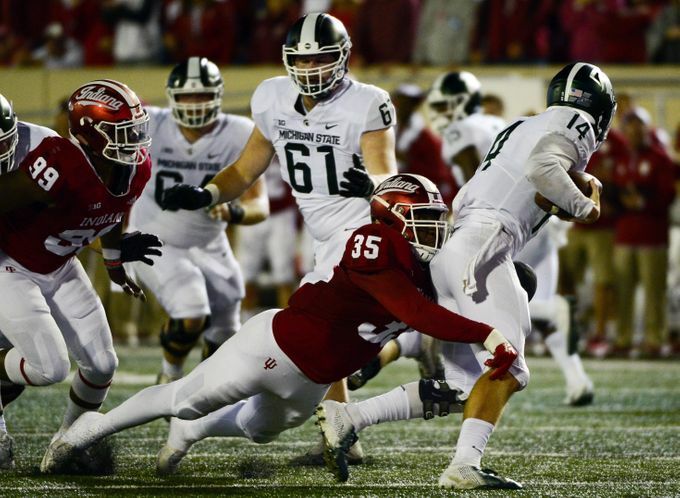 IU’s run defense was stout against Sparty…until it wasn’t. Down 7 late in the 4th and needing to force a 3-and-out, the Hoosier defense had problems with alignment, gap responsibilities and pursuit angles in giving up an untouched 75-yard jet sweep TD (but other than all that, they played it perfectly). Against the Scarlet Knights, IU’s run defense was again above average, with the possible exception of a 36-yd run on Rutgers’ first drive. In the tackling realm, the big news is that Dameon Willis finally played a game without missing a tackle! Against Rutgers, three of IU’s missed tackles (Everett, Sykes and Jones) were on one 8-yd run. If you are going to miss a ton of tackles, sometimes it’s better to do it all at once and relatively close to the line of scrimmage. Nevertheless, through 5 games, tackling has not been a major concern for this team. Again, looking ahead, I think we can expect the Ohio State offense to break a few big runs using some combination of J.K. Dobbins, Mike Weber and their speedy receivers on jet sweeps. The bigger question to me is whether IU can limit their other runs to 3 or fewer yards, rather than 4, 5 or 6. If IU has any chance of stopping Ohio State, it has to keep the Buckeyes off schedule. Check back tomorrow for the offense’s Rutgers charts.